Arbroath is an extremely attractive harbour town that comes complete with a superb medieval abbey and amply repays exploration. 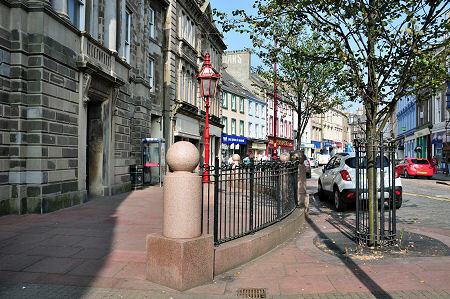 It is the largest town in Angus and stands on the North Sea coast some 17 miles north east of Dundee and 45 miles south west of Aberdeen. The main A92 passes close by the centre of the town and gives excellent access to free car parks in the area of the harbour at the south end of the town, around Arbroath Abbey at the north end of the town, or serving the shopping streets that lie between them. The town is sufficiently compact to allow you to park up wherever is most convenient and explore on foot. Arbroath is a town with ancient origins. There seems to have been a port of some sort at the mouth of the Brothock Burn in Pictish times. 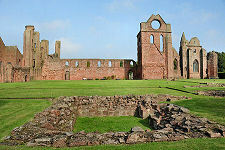 The town entered recorded history with the founding of Arbroath Abbey in 1178, which probably displaced an earlier monastery at St Vigeans, just over a mile to the north. It is known that a wooden pier had been built at Arbroath by 1194, and the first harbour, known as the Abbot's Harbour, was built in 1394. Arbroath's name comes from its position at the mouth of the Brothock Burn. Through much of history the town was usually called "Aberbrothock", though as early as the 1600s it was sometimes being called by the shortened form "Arbroath" (or one of a number of variants of both its long and short names). By the mid 1800s "Arbroath" was being fairly universally used. Today the name of Arbroath is known worldwide for two very different reasons. In April 1320, Bernard, Abbot of Arbroath, oversaw the drafting of the "Declaration of Arbroath", thought by many to be the most important and influential document in Scottish history. This was a letter written to Pope John XXII on behalf of Robert the Bruce, and signed by most of the great and good of early 14th Century Scotland. It asked the Pope to put pressure on Edward II of England to recognise Robert the Bruce as the legitimate King of Scotland; and it also asked him to remove the excommunication that had been placed on Robert after he had murdered the Red Comyn in a Dumfries church in 1306. The Declaration is famous for one phrase in particular: "For, as long as but a hundred of us remain alive, never will we on any conditions be brought under English rule. It is in truth not for glory, nor riches, nor honours that we are fighting, but for freedom  for that alone, which no honest man gives up but with life itself." Much more historically significant was the implication elsewhere in the document that in future the King of Scotland could only rule with the approval of the people of Scotland. It was the first time anyone, anywhere, had thought about royalty in this way. 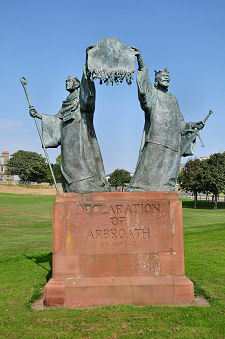 The Declaration of Arbroath is seen by many as influencing both the Magna Carta in England and the US Declaration of Independence. Arbroath is also renowned as the home of Arbroath Smokies. These are pairs of haddock tied at the tails and smoked over burning hardwood chips in 1.5m square barrels. This process still takes place in any number of back street smokeries close to Arbroath's harbour: and the delicious product can be sampled from the many traditional fishmongers still operating in the town. The good news is that under European Law the Arbroath Smokie has been given the same protection as Champagne: if they are not smoked within an eight kilometer radius of Arbroath Town House they are not Arbroath Smokies. Ironically, Arbroath Smokies were first produced not in Arbroath but four miles up the coast (and within the designated area) in the small fishing village of Auchmithie. If Arbroath's early growth depended heavily on Arbroath Abbey the last few centuries have seen it look much more to the sea for its prosperity. And not just to fishing, though this has been and continues to be important to the town. The 1394 harbour was built at the interestingly named Danger Point, and remained in operation until destroyed in a gale in 1706. Its 1734 replacement was expanded in 1842 and again in 1877, and Arbroath in its time has been an important trading port with destinations in Scandinavia and as far afield as North America. Near the harbour is the Arbroath Signal Tower Museum. This was built in 1813 as the shore station for the Bell Rock lighthouse, erected by Robert Stevenson in the years up to 1811 to warn mariners of a notorious rock 11½ miles south east of Arbroath. This was the first time anyone had ever built a lighthouse on a rock that was submerged every high tide and the construction of the 115ft high structure marked the pinnacle of the lighthouse building achievements of the Stevenson family. Lighthouse keepers' families lived in the signal tower until 1955: it is now a free museum. Bell Rock lighthouse was automated in 1988. 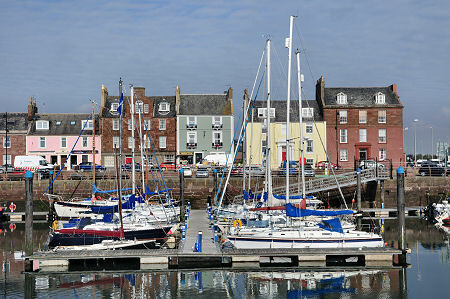 Arbroath's harbour and its abbey are connected by a partly pedestrianised High Street which with the surrounding town centre offers the full range of shops and civic buildings you'd expect from somewhere with a history that is quite so long and prestigious. A mile north of the centre of Arbroath is the superb St Vigeans Museum of Carved Stones, on the site of an early Pictish monastery. Arbroath has one final claim to fame. On 12 September 1885 a professional football match held in the town resulted in a scoreline of Arbroath, 36: Bon Accord (an Aberdeen club), 0. For over a century this stood as the largest margin of victory in professional football until a match held in Madagascar on 31 October 2002 resulted in a scoreline of AS Adema, 149: Stade Olympique de l'Emyrne, 0. Though as the losing side in Madagascar were deliberately scoring own goals in protest against refereeing decisions in earlier matches, it is debatable whether this match should really be counted.